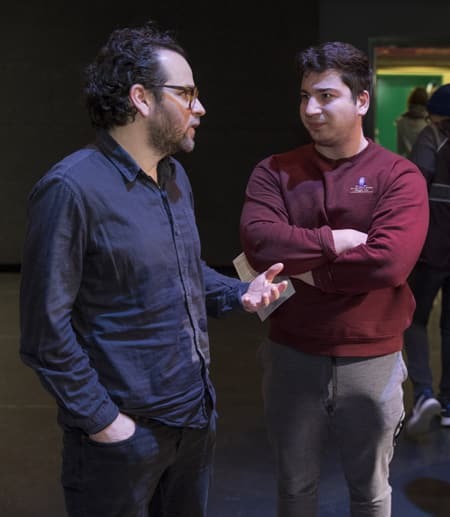 Arts & Sciences students Luby Kiriakidi and Molly Karr, both '18, were two of 10 students chosen for an audition workshop with Sam Gold '00, winner of theTony award in 2015 as best director for the musical “Fun Home” and nominee in 2017 as best director for the play “A Doll’s House Part 2.” Gold visited campus March 24-25 for a conversation with PMA professor David Feldshuh and the student workshop. Here, Kiriakidi and Karr share their impressions of the workshop. Sam Gold, Tony winner and resident director at the Roundabout Theatre, visited Cornell to give a speech about his impressive career in theatre. He also graciously hosted an audition workshop for 10 Cornell students the following day, which I was lucky enough to be able to participate in. Gold began the workshop by undercutting the idea of a monologue as a whole, saying that no one really does their best work when doing them and that he does not use monologues to cast actors in his own plays. Instead, he insisted that the space was a rehearsal, and to not think of it as a formal audition. Personally, this really helped ease the tension of the workshop for me, and definitely settled my nerves on performing a monologue. Specific terminology is really important for actors. For instance, I never say that I am “practicing” my scene, but rather say I am “rehearsing” it – even the smallest of differences affects my mental state on whatever I work on. During each student’s monologue, Gold would ask questions such as, “Who are you talking to? How will you make them stay?” in order to help the student raise the stakes of their text. Gold would also improv lines meant to evoke certain emotions from the students – myself included – as if he was the other character in a scene. This was a great way for students to connect with the text without sounding forced. Speaking of text, one of the most consistent comments Gold stressed for every student was to stick to it and to not force emotion on the lines: they speak for themselves. Focusing on grammar and the little words, not just emphasizing the action verbs, is an understatedly important part of monologues. For me, I did a piece from the musical Assassins by Stephen Sondheim and John Weidman. A lesser-known play, Gold still managed to provide sharp insight into my character and helped me tremendously in the few minutes we had together. Overall, it was such an enriching opportunity for students like myself, who want to be actors, to get to work with him and watch him direct. Perhaps Sam Gold could tell that we were nervous when he said that monologues, and auditions based on monologues, are not how people succeed in the industry. It’s not about the perfect monologue or the perfect audition, it’s about being seen in a play or establishing connections so a director already has you in mind for a specific role when he or she is casting. Gold changed the vibe of the workshop from an audition to a rehearsal, and his disregard for monologues showed when he treated them like scenes, helping each actor find their invisible scene partner and establishing that relationship and playable, doable actions. He deconstructed each “performed,” emotion-based monologue meant for an audience to a toned-down, text-based scene for one targeted person, with a much clearer objective. Each “scene” transformed with absolute clarity because, as Gold said himself, a good director is a bad listener, so we actors had to work to keep him hooked. I was fascinated to see him peel away our over-the-top emotions to find the game and beauty of the text. Gold is clearly a lover of language and his minimalistic approach maintains an integrity to what the playwright created. I was personally challenged to undo the distance I created with my far away, imaginary scene partner which allowed me to over-perform and be less cognizant of the present audience (which is how I deal with nerves, I think), and instead put my scene partner on the stage with me, to show a real conversation with real objectives, vulnerability, and clumsiness that an over-prepared, isolated monologue could not convey. Although monologues have been deemed useless, the experience of acting in a higher-pressure situation in front of this talented director has been an invaluable, insightful take-away.